Book your Tamarac junk removal from XS Trash if your home or business is becoming too cluttered with junk. We clear out attics, basements, garages, backyards, warehouses, office suites, storefronts, condos, vacant land, and any junk removal project on your agenda. We are very reliable and very affordable, and our company is willing to schedule your project at a time acceptable to you. 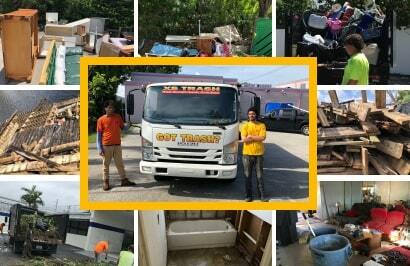 Call our helpful staff and secure one of the most outstanding junk removal services operating in South Florida. As a well-known Tamarac junk removal company with modern resources, we go above and beyond the competition. You can count on our skills and our punctuality. XS Trash upholds high standards and has earned a great name for Tamarac junk removal. We offer a wide range of services to both residential and commercial properties. Our fully trained workers focus directly on customer satisfaction. We always make sure that we discuss scheduling with you first, to give you flexibility and make everything convenient for you. Same-day service, by special arrangement, may even be possible. We haul away as little as one item, or several truckloads. If you want removal done during your lunch break, let us know. If you prefer weekend service, let us know. You can trust XS Trash to get you cleaned up fast and safely! Licensed & Insured Tamarac Junk Removal, Junk Pickup & Hauling.